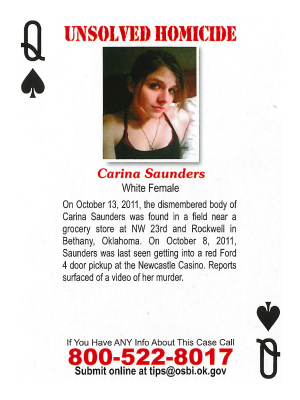 On October 13, 2011, the dismembered body of Carina Saunders was found in a field near a grocery store at NW 23rd and Rockwell in Bethany, Oklahoma. On October 8, 2011, Saunders was last seen getting into a red Ford 4 door pickup at the Newcastle Casino. Reports surfaced of a video of her murder.